El Amgem Tour of California tiene primer líder y es colombiano: Fernando Gaviria ha ganado la primera etapa de la carrera, una llegada masiva muy agónica que se ha lanzado desde muy lejos. La etapa inaugural, un circuito urbano en Long Beach, sumaba 134 kilómetros absolutamente llanos. Así que la llegada al sprint era un fijo en los pronósticos. Y si además se tiene en cuenta que la fuga apenas tenía dos integrantes, mucho más. 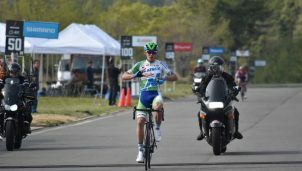 Aún así, Andrei Krasilnikau (Holowesko) y Tanner Putt (UnitedHealthcare) han tenido su cuota de protagonismo en la etapa, se han disputado los sprints intermedios y han sido absorbidos por el pelotón justo cuando sonaba la campana de la última vuelta. Quick Step ha sido capaz de gobernar en primera instancia para Gaviria, y dentro del kilómetro final se han producido numerosos toques entre los contendientes. 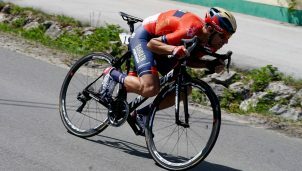 Finalmente el colombiano ha sido capaz de aguantar la embestida de Caleb Ewan y también a Philipssen. Para la noche de este martes, hora española, queda la segunda etapa que será el primer final en alto de la ronda californiana con final en Gibraltar Road. Serán 12 kilómetros de subida a una media del 8%, suficiente para determinar ya quiénes serán los que luchen por la general. 3 SAGAN Peter BORA – hansgrohe m.t. 4 KITTEL Marcel Team Katusha – Alpecin m.t. 6 PHILIPSEN Jasper Hagens Berman Axeon m.t. 7 REIJNEN Kiel Trek – Segafredo m.t. 8 WALSCHEID Max Team Sunweb m.t. 9 MAGNER Ty Rally Cycling m.t. 10 CAVENDISH Mark Dimension Data m.t. 11 OLIVEIRA Ivo Hagens Berman Axeon m.t. 12 MCCABE Travis UnitedHealthcare Pro Cycling Team m.t. 13 BEVIN Patrick BMC Racing Team m.t. 14 MURPHY John Holowesko -Citadel p/b Arapahoe Resources m.t. 15 WISNIOWSKI Lukasz Team Sky m.t. 16 MCLAY Daniel Team EF Education First-Drapac p/b Cannondale m.t. 17 RICHEZE Ariel Maximiliano Quick-Step Floors m.t. 18 MEZGEC Luka Mitchelton-Scott m.t. 19 POWLESS Neilson Team LottoNL-Jumbo m.t. 20 TOLHOEK Antwan Team LottoNL-Jumbo m.t. 21 YATES Adam Mitchelton-Scott m.t. 22 ROWE Luke Team Sky m.t. 23 BERNAL Egan Arley Team Sky m.t. 24 CARPENTER Robin Rally Cycling m.t. 25 PHINNEY Taylor Team EF Education First-Drapac p/b Cannondale m.t. 26 BODNAR Maciej BORA – hansgrohe m.t. 27 GAUTIER Cyril AG2R La Mondiale m.t. 28 GEOGHEGAN HART Tao Team Sky m.t. 29 GARRISON Ian Hagens Berman Axeon m.t. 30 DE TIER Floris Team LottoNL-Jumbo m.t. 31 CRADDOCK Lawson Team EF Education First-Drapac p/b Cannondale m.t. 32 SLAGTER Tom-Jelte Dimension Data m.t. 33 TEUNISSEN Mike Team Sunweb m.t. 34 FRÖHLINGER Johannes Team Sunweb m.t. 35 MAJKA Rafał BORA – hansgrohe m.t. 36 HAYMAN Mathew Mitchelton-Scott m.t. 37 HOWES Alex Team EF Education First-Drapac p/b Cannondale m.t. 38 DE VOS Adam Rally Cycling m.t. 39 WYNANTS Maarten Team LottoNL-Jumbo m.t. 40 MIRZA Yousef Mohamed UAE-Team Emirates m.t. 41 KOLAR Michael BORA – hansgrohe m.t. 42 FRANK Mathias AG2R La Mondiale m.t. 43 BAUER Jack Mitchelton-Scott m.t. 44 MCNULTY Brandon Rally Cycling m.t. 45 SAGAN Juraj BORA – hansgrohe m.t. 46 ARNDT Nikias Team Sunweb m.t. 47 SCHAR Michael BMC Racing Team m.t. 48 ZABEL Rick Team Katusha – Alpecin m.t. 49 LEEZER Tom Team LottoNL-Jumbo m.t. 50 VERMOTE Julien Dimension Data m.t. 51 RAVASI Edward UAE-Team Emirates m.t. 52 GUERREIRO Ruben Trek – Segafredo m.t. 53 OWEN Logan Team EF Education First-Drapac p/b Cannondale m.t. 54 TVETCOV Serghei UnitedHealthcare Pro Cycling Team m.t. 55 BOOKWALTER Brent BMC Racing Team m.t. 56 DURASEK Kristijan UAE-Team Emirates m.t. 57 VAN GARDEREN Tejay BMC Racing Team m.t. 58 SIVAKOV Pavel Team Sky m.t. 59 DE PLUS Laurens Quick-Step Floors m.t. 60 BENNETT Sean Hagens Berman Axeon m.t. 61 STUYVEN Jasper Trek – Segafredo m.t. 62 MANNION Gavin UnitedHealthcare Pro Cycling Team m.t. 63 HAEDO Lucas Sebastian UnitedHealthcare Pro Cycling Team m.t. 64 VANDENBERGH Stijn AG2R La Mondiale m.t. 65 KUSS Sepp Team LottoNL-Jumbo m.t. 66 HENAO Sebastián Team Sky m.t. 67 BARTA William Hagens Berman Axeon m.t. 68 BRYON Miguel Holowesko -Citadel p/b Arapahoe Resources m.t. 69 EISENHART Taylor Holowesko -Citadel p/b Arapahoe Resources m.t. 70 STETINA Peter Trek – Segafredo m.t. 71 VAN HOOYDONCK Nathan BMC Racing Team m.t. 72 BYSTRØM Sven Erik UAE-Team Emirates m.t. 73 ASGREEN Kasper Quick-Step Floors m.t. 74 POLJANSKI Pawel BORA – hansgrohe m.t. 75 PATE Danny Rally Cycling m.t. 76 GASTAUER Ben AG2R La Mondiale m.t. 77 CLARKE Simon Team EF Education First-Drapac p/b Cannondale m.t. 78 RAST Gregory Trek – Segafredo m.t. 79 FABBRO Matteo Team Katusha – Alpecin m.t. 80 BOSWELL Ian Team Katusha – Alpecin m.t. 81 KLUGE Roger Mitchelton-Scott m.t. 82 ROSSKOPF Joey BMC Racing Team m.t. 83 NARVAEZ Jhonatan Quick-Step Floors m.t. 84 GANNA Filippo UAE-Team Emirates m.t. 85 CLARKE Jonathan UnitedHealthcare Pro Cycling Team m.t. 86 BRITTON Rob Rally Cycling m.t. 88 PUTT Tanner UnitedHealthcare Pro Cycling Team m.t. 89 HINDLEY Jai Team Sunweb m.t. 90 HUFFMAN Evan Rally Cycling m.t. 91 AIT EL ABDIA Anass UAE-Team Emirates m.t. 92 OSS Daniel BORA – hansgrohe m.t. 93 HEPBURN Michael Mitchelton-Scott m.t. 94 MORTON Lachlan Dimension Data m.t. 95 HODEG Álvaro José Quick-Step Floors m.t. 96 DAVIES Scott Dimension Data m.t. 97 WYSS Danilo BMC Racing Team m.t. 98 THOMSON Jay Robert Dimension Data m.t. 99 NAESEN Oliver AG2R La Mondiale m.t. 100 SKUJIŅŠ Toms Trek – Segafredo m.t. 101 LIENHARD Fabian Holowesko -Citadel p/b Arapahoe Resources m.t. 102 STANNARD Ian Team Sky m.t. 103 BJERG Mikkel Hagens Berman Axeon m.t. 104 COMPANIONI Ruben Holowesko -Citadel p/b Arapahoe Resources m.t. 105 NORRIS Lachlan UnitedHealthcare Pro Cycling Team m.t. 107 CONCI Nicola Trek – Segafredo m.t. 108 DILLIER Silvan AG2R La Mondiale m.t. 109 KRASILNIKAU Andrei Holowesko -Citadel p/b Arapahoe Resources m.t. 110 RHIM Brendan Holowesko -Citadel p/b Arapahoe Resources m.t. 111 RICE Michael Hagens Berman Axeon m.t. 112 COSNEFROY Benoit AG2R La Mondiale m.t. 3 PUTT Tanner UnitedHealthcare Pro Cycling Team m.t. 5 KRASILNIKAU Andrei Holowesko -Citadel p/b Arapahoe Resources m.t. 7 HODEG Álvaro José Quick-Step Floors m.t. 9 KRISTOFF Alexander UAE-Team Emirates m.t. 10 PHILIPSEN Jasper Hagens Berman Axeon m.t. 11 REIJNEN Kiel Trek – Segafredo m.t. 12 WALSCHEID Max Team Sunweb m.t. 13 MAGNER Ty Rally Cycling m.t. 14 OLIVEIRA Ivo Hagens Berman Axeon m.t. 15 MCCABE Travis UnitedHealthcare Pro Cycling Team m.t. 16 BEVIN Patrick BMC Racing Team m.t. 17 MURPHY John Holowesko -Citadel p/b Arapahoe Resources m.t. 18 WISNIOWSKI Lukasz Team Sky m.t. 19 MCLAY Daniel Team EF Education First-Drapac p/b Cannondale m.t. 20 RICHEZE Ariel Maximiliano Quick-Step Floors m.t. 21 MEZGEC Luka Mitchelton-Scott m.t. 22 POWLESS Neilson Team LottoNL-Jumbo m.t. 23 TOLHOEK Antwan Team LottoNL-Jumbo m.t. 24 YATES Adam Mitchelton-Scott m.t. 25 ROWE Luke Team Sky m.t. 26 BERNAL Egan Arley Team Sky m.t. 27 CARPENTER Robin Rally Cycling m.t. 28 PHINNEY Taylor Team EF Education First-Drapac p/b Cannondale m.t. 29 BODNAR Maciej BORA – hansgrohe m.t. 30 GAUTIER Cyril AG2R La Mondiale m.t. 31 GEOGHEGAN HART Tao Team Sky m.t. 32 GARRISON Ian Hagens Berman Axeon m.t. 33 DE TIER Floris Team LottoNL-Jumbo m.t. 34 CRADDOCK Lawson Team EF Education First-Drapac p/b Cannondale m.t. 35 SLAGTER Tom-Jelte Dimension Data m.t. 36 TEUNISSEN Mike Team Sunweb m.t. 37 FRÖHLINGER Johannes Team Sunweb m.t. 38 MAJKA Rafał BORA – hansgrohe m.t. 39 HAYMAN Mathew Mitchelton-Scott m.t. 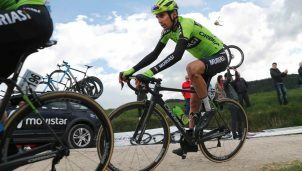 40 HOWES Alex Team EF Education First-Drapac p/b Cannondale m.t. 41 DE VOS Adam Rally Cycling m.t. 42 WYNANTS Maarten Team LottoNL-Jumbo m.t. 43 MIRZA Yousef Mohamed UAE-Team Emirates m.t. 44 KOLAR Michael BORA – hansgrohe m.t. 45 FRANK Mathias AG2R La Mondiale m.t. 46 BAUER Jack Mitchelton-Scott m.t. 47 MCNULTY Brandon Rally Cycling m.t. 48 SAGAN Juraj BORA – hansgrohe m.t. 49 ARNDT Nikias Team Sunweb m.t. 50 SCHAR Michael BMC Racing Team m.t. 51 ZABEL Rick Team Katusha – Alpecin m.t. 52 LEEZER Tom Team LottoNL-Jumbo m.t. 53 VERMOTE Julien Dimension Data m.t. 54 RAVASI Edward UAE-Team Emirates m.t. 55 GUERREIRO Ruben Trek – Segafredo m.t. 56 OWEN Logan Team EF Education First-Drapac p/b Cannondale m.t. 57 TVETCOV Serghei UnitedHealthcare Pro Cycling Team m.t. 58 BOOKWALTER Brent BMC Racing Team m.t. 59 DURASEK Kristijan UAE-Team Emirates m.t. 60 VAN GARDEREN Tejay BMC Racing Team m.t. 61 SIVAKOV Pavel Team Sky m.t. 62 DE PLUS Laurens Quick-Step Floors m.t. 63 BENNETT Sean Hagens Berman Axeon m.t. 64 STUYVEN Jasper Trek – Segafredo m.t. 65 MANNION Gavin UnitedHealthcare Pro Cycling Team m.t. 66 HAEDO Lucas Sebastian UnitedHealthcare Pro Cycling Team m.t. 67 VANDENBERGH Stijn AG2R La Mondiale m.t. 68 KUSS Sepp Team LottoNL-Jumbo m.t. 69 HENAO Sebastián Team Sky m.t. 70 BARTA William Hagens Berman Axeon m.t. 71 BRYON Miguel Holowesko -Citadel p/b Arapahoe Resources m.t. 72 EISENHART Taylor Holowesko -Citadel p/b Arapahoe Resources m.t. 73 STETINA Peter Trek – Segafredo m.t. 74 VAN HOOYDONCK Nathan BMC Racing Team m.t. 75 BYSTRØM Sven Erik UAE-Team Emirates m.t. 76 ASGREEN Kasper Quick-Step Floors m.t. 77 POLJANSKI Pawel BORA – hansgrohe m.t. 78 PATE Danny Rally Cycling m.t. 79 GASTAUER Ben AG2R La Mondiale m.t. 80 CLARKE Simon Team EF Education First-Drapac p/b Cannondale m.t. 81 RAST Gregory Trek – Segafredo m.t. 82 FABBRO Matteo Team Katusha – Alpecin m.t. 83 BOSWELL Ian Team Katusha – Alpecin m.t. 84 KLUGE Roger Mitchelton-Scott m.t. 85 ROSSKOPF Joey BMC Racing Team m.t. 86 NARVAEZ Jhonatan Quick-Step Floors m.t. 87 GANNA Filippo UAE-Team Emirates m.t. 88 CLARKE Jonathan UnitedHealthcare Pro Cycling Team m.t. 89 BRITTON Rob Rally Cycling m.t. 90 MARTINEZ Daniel Felipe Team EF Education First-Drapac p/b Cannondale m.t. 91 HINDLEY Jai Team Sunweb m.t. 92 HUFFMAN Evan Rally Cycling m.t. 93 AIT EL ABDIA Anass UAE-Team Emirates m.t. 94 OSS Daniel BORA – hansgrohe m.t. 95 HEPBURN Michael Mitchelton-Scott m.t. 96 MORTON Lachlan Dimension Data m.t. 97 DAVIES Scott Dimension Data m.t. 98 WYSS Danilo BMC Racing Team m.t. 99 THOMSON Jay Robert Dimension Data m.t. 100 NAESEN Oliver AG2R La Mondiale m.t. 101 SKUJIŅŠ Toms Trek – Segafredo m.t. 102 LIENHARD Fabian Holowesko -Citadel p/b Arapahoe Resources m.t. 103 STANNARD Ian Team Sky m.t. 104 BJERG Mikkel Hagens Berman Axeon m.t. 105 COMPANIONI Ruben Holowesko -Citadel p/b Arapahoe Resources m.t. 106 NORRIS Lachlan UnitedHealthcare Pro Cycling Team m.t. 108 CONCI Nicola Trek – Segafredo m.t. 109 DILLIER Silvan AG2R La Mondiale m.t.